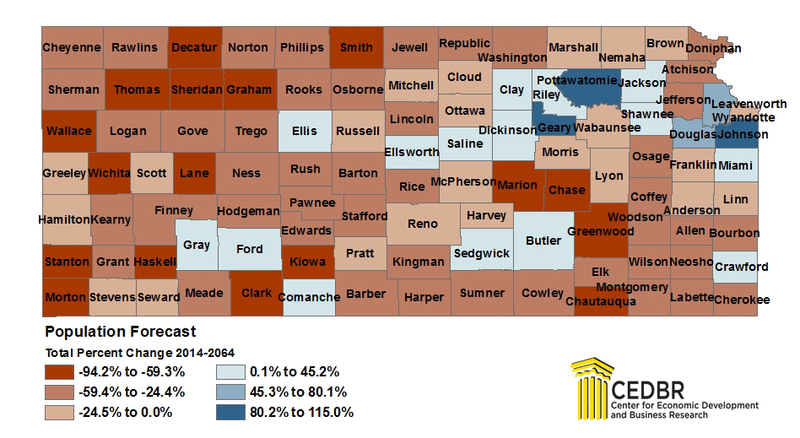 The Kansas Population Forecast from 2014 to 2064 shows a sizeable shift from rural to metropolitan area residents. While the overall population of the state of Kansas will continue to grow between now and 2064, the Kansas City, Kansas region will see the largest growth in population. Additional population projections, based on age, gender and county, can be seen on this map and in the more detailed articles and videos below. The Kansas Population Forecast is based primarily on the age-cohort survival method of forecasting. For each county, each five year age-gender cohort’s population change was forecasted in five year increments, starting with U.S. Census Population Estimates data for 2014.